TINTON FALLS, NEW JERSEY, April 18, 2018 – Angel Medical Systems, Inc. has received U.S. Food and Drug Administration (FDA) premarket approval (PMA) for the ‘AngelMed Guardian® System’. 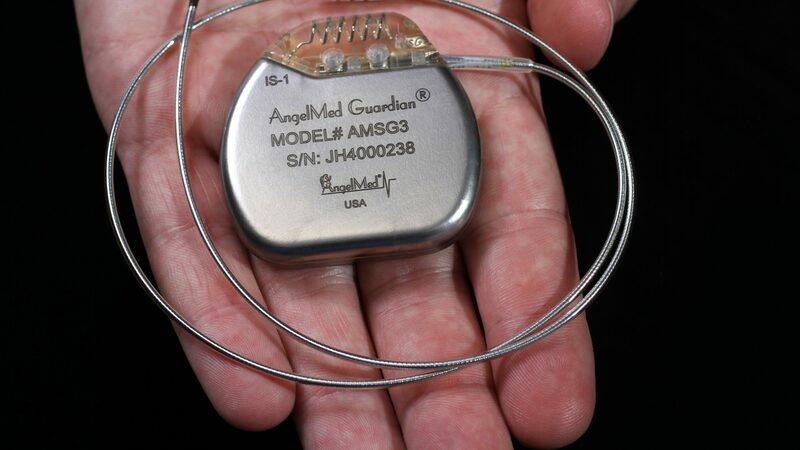 The AngelMed Guardian System is an implantable cardiac monitor with patient alerting capability and an additional external alarm device. It is indicated for use in patients who have had prior ACS events including myocardial infarctions (heart attacks) or unstable angina and who remain at high risk for recurrent ACS events. The Guardian System is an adjunct to patient recognized symptoms by detecting potential ongoing ACS events, characterized by sustained ST segment changes, and alerting the patient to seek medical attention for those events. The Guardian System is implanted like a pacemaker, typically in less than an hour under a local anesthetic. This well-studied implantation technique demonstrated an adverse event rate that was also very similar to the rate seen for pacemaker implants. The types of adverse events seen were also similar to those seen with pacemaker implants. “The Guardian device fills an unmet medical need by providing more effective diagnosis of a life-threatening condition when compared to patient symptoms alone. The Guardian provides this adjunctive benefit without increasing the rate of false positives and may in fact reduce that rate. A very important capability of the Guardian is that in the absence of symptoms, it may identify ACS events, including heart attacks, and prompt the patient to seek medical attention.” said Angel Medical System’s Chief Executive Officer, Dr. David R. Fischell. “Getting FDA PMA approval is a major accomplishment in the 15 year history of Angel Medical Systems and represents combined efforts and significant contributions from our employees, advisors, implanting doctors and, of course, the patients in our clinical studies, who believed in us. Helping those patients was always foremost in our minds and hearts.” said Angel Medical System’s Chief Operating Officer, David Keenan. Approval of the ‘AngelMed Guardian System’ by the U.S. FDA was based on preclinical and clinical data, including data derived from the ALERTS Clinical Study that began in 2009. One hundred centers across the U.S. participated in the ALERTS Clinical Study, with 910 patients implanted. The ALERTS Clinical Study concluded in 2015 after accumulating 3,450 implant years of follow-up data. According to the American Heart Association, one of every five deaths in the U.S. is attributable to coronary heart disease, making heart attacks the number 1 killer nationwide. Early detection of heart attacks and prompt intervention has been shown to improve clinical outcomes. Despite efforts to educate the public over the past decade, the time from heart attack (MI) symptom onset to arrival at a hospital for treatment has not changed. In the ALERTS Clinical Study, the median time from symptom onset to arrival at the hospital for a heart attack was one hour. About Angel Medical Systems, Inc.
Angel Medical Systems, Inc. was founded in 2001 by Drs. Robert, Tim and David Fischell, active serial entrepreneurs and inventors of medical devices. In 1999, the company filed its first of more than 50 issued US patents relating to detecting cardiac events and patient alerting, with the company’s first human implant occurring in 2005. This press release contains forward-looking statements within the meaning of Section 27A of the Securities Act of 1933 and Section 21E of the Securities Exchange Act of 1934. Forward-looking statements may be identified by words like “anticipate,” “expect,” “project,” “believe,” “plan,” “estimate,” “intend” and similar words. These forward-looking statements are based on our beliefs, assumptions and estimates using information available to us at the time and are not intended to be guarantees of future events or performance. These forwardlooking statements include, among other things, statements regarding our business plans, regulatory approvals and product performance and impact. If our underlying assumptions turn out to be incorrect, or if certain risks or uncertainties materialize, actual results could vary materially from the expectations and projections expressed or implied by our forward-looking statements. These factors, in some cases, have affected and in the future (together with other factors) could affect our ability to implement our business strategy and may cause actual results to differ materially from those contemplated by the statements expressed in this press release. As a result, readers are cautioned not to place undue reliance on any of our forward-looking statements.